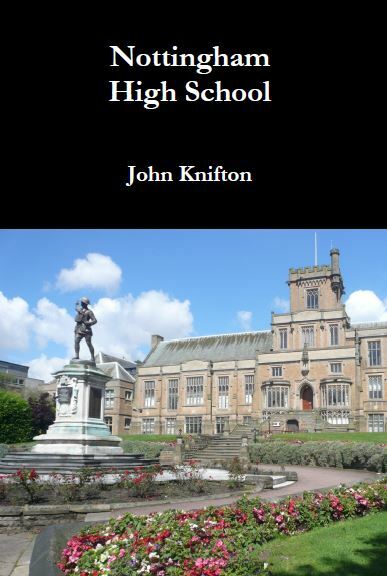 Because of this, I make sure that I take the Sixth Form Birdwatching Group down there for a quick look round during our birdwatching afternoon. And indeed, when we do find the bird, it does turn out to be a bit of a puzzler. First of all, it is completely alone on the river, while all the other ducks are on the main lake. This is a very good start in proving that it is a rare bird, blown across the stormy waters of the Atlantic Ocean from the USA. Everybody knows that rare birds always keep well separate from any strange foreigners they are suddenly brought into contact with. It’s because vagrants are shy, uncertain of themselves and take a very long time to make friends., They may not speak English. They may be afraid of being eaten. 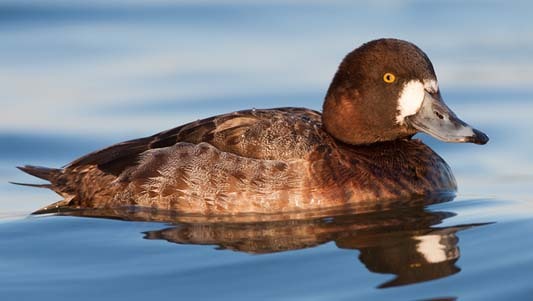 Superficially, the stranger is all brown, rather like a female Tufted Duck, but it’s not a definite Tufted Duck because the head shape is wrong. 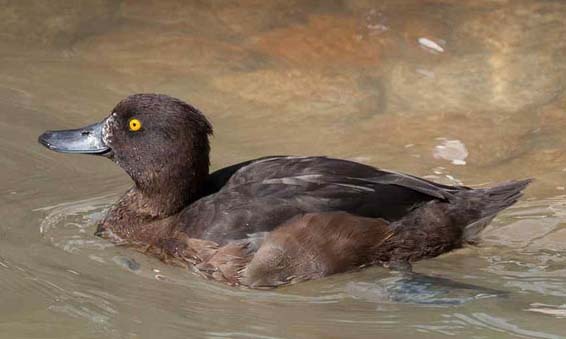 Instead of a tuft, or the basis of a tuft, the bird has a rounded head like a Greater Scaup. It’s not a Greater Scaup either though, because the head shape is not right for that species either. 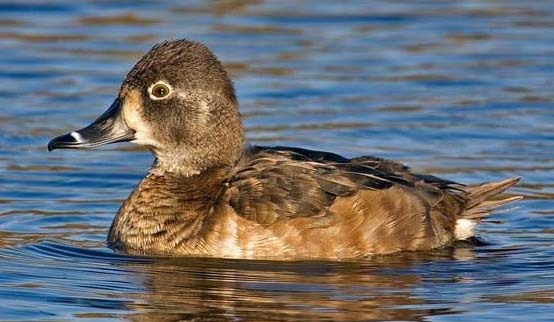 Instead of a completely rounded head like a Greater Scaup, it has a little peaked crown, rather like the head shape of Ring-necked Duck. At the other end of the spectrum, the more likely solution, and the easiest cop out is to say is that it is a hybrid, the fate of at least two of the county’s previous claims. But a hybrid of what? Scaup and Lesser Scaup? Tufted Duck and Ring-necked Duck? Still, it was a bit of excitement on an otherwise dreary day. 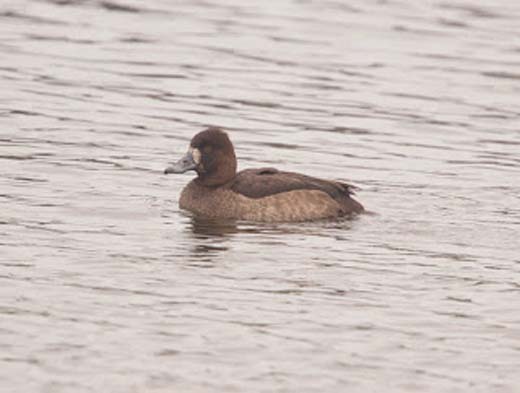 And indeed – why should a female Lesser Scaup be impossible at Attenborough, while a male, the first ever seen in Britain, is acceptable at Chasewater, only some fifty miles away? If I had my time over again, I would have made a bigger effort to ascertain two things, one relatively easy, the other much more difficult. It would have been reasonably easy to have checked the extent of any white areas at the base of this puzzling bird’s bill. The photographs above show how important this detail might have been. 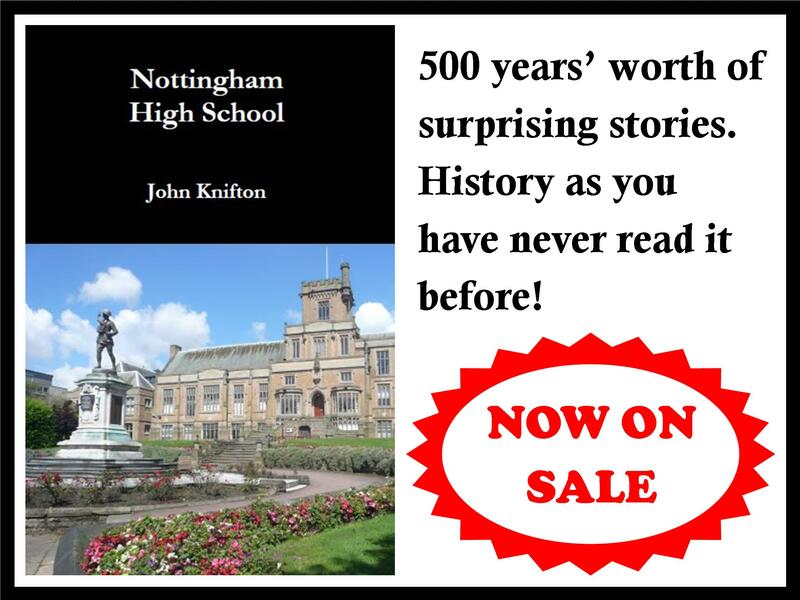 Nowadays, getting on for thirty years later, I quite simply cannot remember, although that very fact in itself would imply that the white cannot have been either unbelievably bright or striking to the observer. Secondly, I would have tried to establish the exact size of this duck, something which would have been very difficult to do as it did not go near any other birds at any point during its stay on the River Trent. Alas, now I shall never know what it was, although it really did seem very strange at the time that it adamantly refused to mix with any other species of duck. By 2007, there had been just under a hundred records of Lesser Scaup in Great Britain with virtually every county having played host to the more easily identifiable male at some point. There had been females but these were admittedly in limited numbers. Here is an Irish female at Rostellan Lake. It is now generally agreed by birdwatchers that Lesser Scaup has never been an incredibly rare vagrant, just a species that was very difficult to identify.